Before you start scrolling to find today’s post or emailing me saying I forget to write something I will let you know I am doing things a little backwards today. It has been a crazy busy day and I didn’t leave much time to write a post so I decided to share with you a more visual post of what my daughter and I have been up to lately. So above you will see my declutter item of the day. A big pile of empty boxes. Actually the top two are full of baseball cards but they are also being decluttered. These boxes are the result of my daughters decluttering efforts over the last nine days while she visited me. As you can see from the caption of the photo above this is a box of stuff she is keeping for now. It will stay in the bottom of her closet until she is better placed to claim it for good. Below are two photos both are of the upper shelf of her old bedroom closet. I think you can figure out for yourselves which is the before and which is the after shot but I have labeled them anyway. The after shot is of smaller boxes of stuff she is keeping for now. The other is what the shelf looked like before we began the big declutter. Quite a good effort don’t you think. Please ignore the fact that the before shot shows empty boxes. I wasn’t planning on doing this post when we got started so had to put all the empty boxes back to get the visual effect. Clearly I am grateful for the great effort my darling girl made to declutter her stuff from my house. All the stuff that was in the boxes was taken to the thrift store today and I had the pleasure of seeing some of it walk out the door with new owners. The boxes of baseball cards made me laugh. My younger son had many more than that and they kept sitting in our house because he didn’t want to deal with them. When he was 26 and we were driving to visit him at his two bedroom apartment I put them in the car and presented them to him. We had a good laugh over it. Now I’ll have to ask 2 years later if he plans to move them across the country this summer when he relocates. Good for you daughter for making such progress! I imagine Juhli that he has lost interest in them but is concerned that there may be a gem among them that is valuable but just doesn’t want to have to plough through them all to be sure. Baseball cards are insidious I think. At least with a lottery ticket you know instantly if you have won or not and the value of the prize is constant. Baseball cards are a whole lot more complicated than that and then hard to part with “just in case”. I hope your son has done himself a favour and just tossed them all in the recycling bin or sold them on to someone who can be bothered with them. I would imagine I have photo documented all the empty boxes that have left the house along the way. I must bring all those photos together in a collage one day for my readers and my own entertainment. And don’t get me started on baseball cards. To me they are just a loop hole in the gambling industry. Just like Beanie Babies, Pokemon cards and the like. They are designed so that some cards are rarer and more desirable than others making them more “valuable”. They can then be sold on at a huge profit. The packs are created and sold so there is no knowing what will be inside, hence the gambling side of the equation. Just like a lottery ticket 99 time out of 100 you are just paying a lot of money for a useless scrap of paper/cardboard. Oh Lena, you are only half getting it when it comes to baseball cards. Please watch this YouTube video and you will get the full picture. I did the same with my kids Lena. I am not sure it worked on both of them. I guess you have to wait until they have their own household, because once you realize you have to get toiletpaper, screws, lightbulbs, flour, internet and all that sort YOURSELF, you start considering additional purchases carefully. well at least thats my experience. You are exactly right Lena. I don’t think they have any idea of all the little extra that need to be afforded until the leave home. I sure will kerb the spending on additional purchases. My daughter started going through her clothes on her own last weekend and got rid of a lot of things. She kept going because she said it felt so good to organize and clean things. 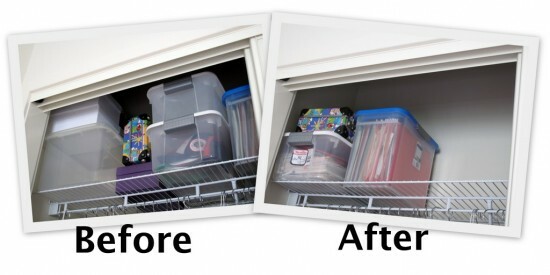 There is a internal reward for decluttering your things. Besides the positive visual peace from having less, you also feel free from having less to be responsible for. We want our kids to learn and try to teach them along the way, but what I hope more than anything else is that the reward of peace and happiness from decluttering is worth taking the time and want them to do it on their own because they want to not just because they are asked to. Hands down – this has to be my most favorite quote in regards to decluttering. I’m just in awe of how well SpendWiseMom summed up things. This is exactly why I declutter but I could never find the words to describe it. 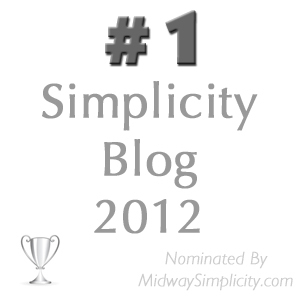 Bravo to SpendWiseMom – well said! I absolutely agree. I think there was a bit of both for her. She did it not only because she knew I was expecting it of her but because ultimately she knows that before too much longer she is going to be responsible for all her stuff and I don’t think the prospect was all that appealing to her. I believe she declutters the stuff that she is living with on a regular basis. She just needs to learn not to acquire so much unnecessary stuff in the fist place. I know you are thrilled at the results and proud of your daughter. I was excited because my mother is up for getting rid of some tablecloths and things. WooHoo!! I really think you have your mom converted Deb J. 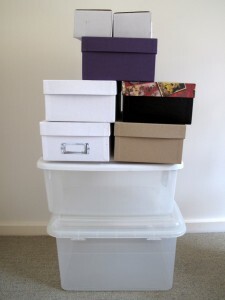 She may not be fast with the decluttering but she is becoming very consistent. 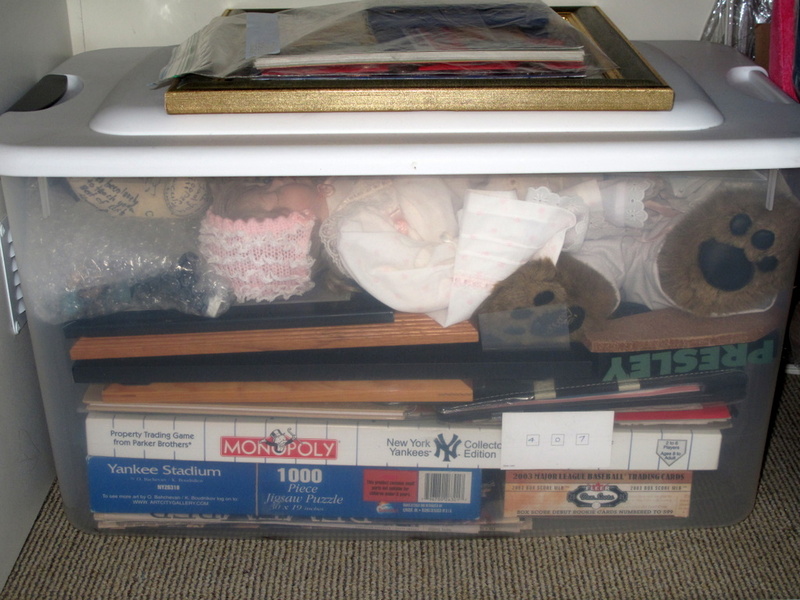 All I have left of items belonging to my children is one large plastic box which is my younger (in grad school) son’s. Mostly, it’s stuff I want him to keep like mementos and his stuffed animals. Next time he visits, I’ll ask him to look through it. Thanks for the reminder! I would do that. I would say there is a good chance he won’t want them any more. My daughter still has two boxes of kitchen items in the garage as well that I have put aside for when she finally has a place of her own. The boxes in the closet were just her personal effects so there will be lots of freed up space once it all goes. I will celebrate that day. Hey, big ovation for Colleen’s daughter – a very good effort indeed. Thanks Katharine, she deserves it. Well done Colleen and daughter! I am cautiously working thru my older teen daughter’s room with her – she had a quandry of what to do with stuff that she didn’t want in her room but was still sentimental to her. We got her a 60 litre plastic bin, put her name on it, and it is to go in our ceiling storage room. We made a deal that if everything didn’t fit, she wasn’t get another bin/box. She thought a 60 litre bin looked huge, so was suprised to see she quickly filled it and there were things left sitting on the floor beside it that were REALLY important to her. So she went back thru and removed some items that she conceded weren’t that important to her, and made room for what was important. A month later she went back thru and eliminated a few more items. I imagine there are things in there that she will hang onto until she has her own home and storage space but until then at least it is all contained and she feels in control of it, and I feel reassured that we’re not going to end up on Dr Phil’s show one day because I threw out her treasures. Does anyone have any advanced ideas to bring to this? Well done, Colleen! Well done, Daughter! Good job, Colleen’s daughter! Love the pile of empty boxes you’re showing today. Colleen, I just have to ask about the baseball cards. What are you doing with them? We have a box full that we would like to get rid of. The only thing stopping us is not knowing what to do with them. What an impressive nine days’ work; I will try this with my daughter next time she is home. You do that Jo. You may be surprised at how much of her stuff she no longer cares about.